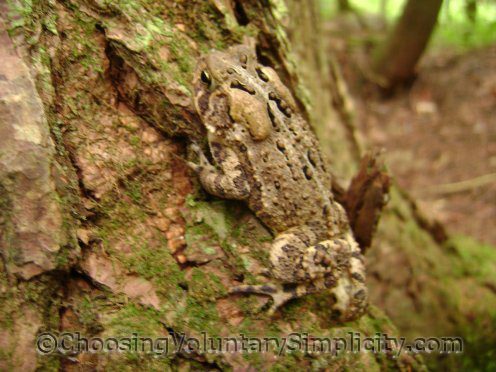 Home » Enjoying Nature / Reader Questions » Can Toads Climb Trees? 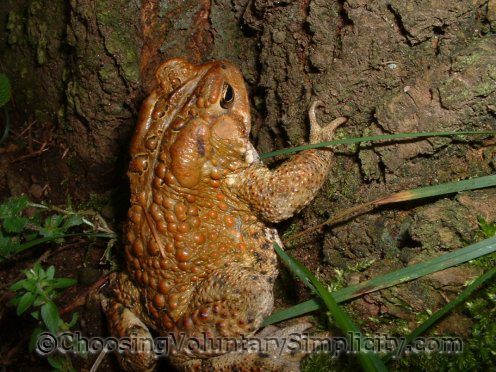 Reader question… “Can ordinary garden toads climb trees? I know I have seen them climbing trees but I can’t find any information to back that up. The toads we have are toads, not tree frogs and they do not have any kind of flat suction pads on their toes. 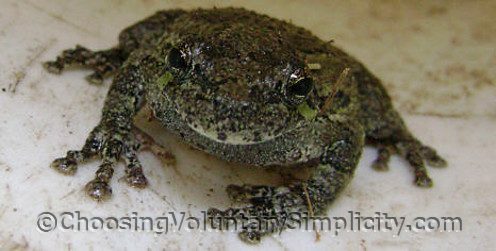 These are just ordinary garden toads and their feet have claws.” –Natalie W.
I agree… there’s an abundance of information out there about tree frogs (often called tree toads) and their ability to climb. I’ve never found any information about ordinary garden toads climbing trees. This toad stopped climbing when it was about three feet off the ground. I was weeding right beside this tree when I saw something moving… and was able to watch as this toad moved quickly up the tree. It stopped and stayed where it was for most of the morning, and eventually backed slowly down to the ground. Another day I just happened to see this toad clinging to the bark of a different tree about four or five feet up. I kept checking back and this toad stayed in the tree for hours. The last time I saw it, it was backing very slowly and was almost down to ground level. Both of these toads clearly are not tree frogs and they do not have suction pads on their feet. They do, however, have fairly long claws that they dig into the crevices in the bark as they climb. And here’s a tree frog. You can see the flat suction pads on its toes. Oddly, we often see tree frogs IN the trees, but I have never seen one actually climbing. We couldn’t agree more with your sub-note. We raised three boys and there was a stretch of time when they would keep snakes, frogs, or turtles from the wild. However, after not too long they realized how miserable the animals were in the cage and gave up on trying to do that any more. Thanks for the validation. I have seen toads climb trees but no one would ever believe me. We have toads here that look like the ones in your photos. I love them in the garden and we try to attract them with moist places to live. Very nice post. Thank-you! I *ALWAYS* learn something when I come to your blog. Just wondering – have you ever thought about writing a book?